At contact-centres.com we’re not ones to hand out industry awards as we tend to leave it to those good folk at the CCMA! 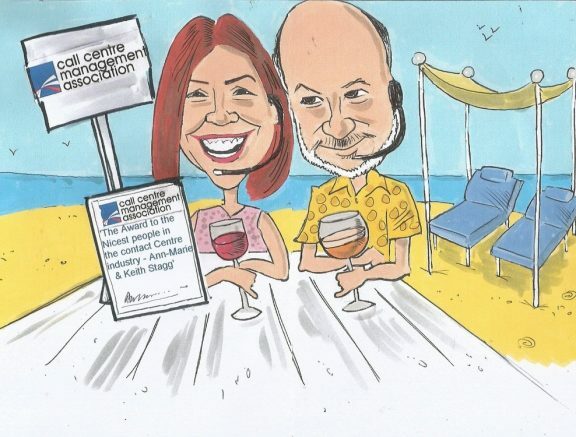 But in recognition of the CCMA’s efforts this year in arranging numerous training events, site visits, a successful and well attended annual conference not to mention two industry awards events, we couldn’t let the opportunity go without recognising the CCMA, and in particular Ann-Marie and Keith Stagg, for their efforts which I am sure I can speak for all of the contact centre industry are much valued and appreciated. So ladies and gentlemen of the UK contact centre industry it is with great pleasure that I am proud to announce the joint winners of ‘The Nicest people in the UK Contact Centre Industry’ award 2016 goes to Ann-Marie and Keith Stagg. Thanks for Steve at @easycartoons – Visit his Website or better still commission him! Be the first to comment on "contact-centres.com Announce Winners of Awards 2016"